Upon arrival at the Guilin airport, pickup by our English speaking tour guide and drive to hotel. Free time for the rest of the day. Recommend you to stroll around the Fir Lake and Banyan Lake in Downtown Guilin at night, the view is magnificent. 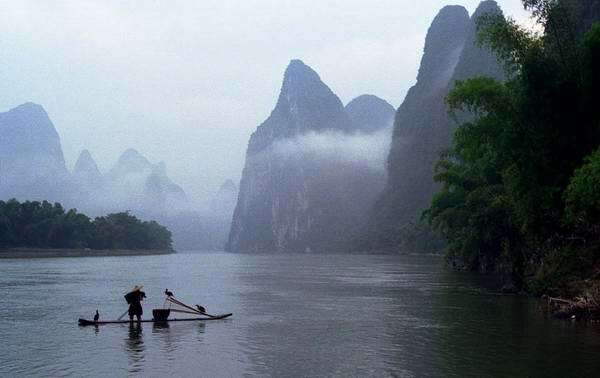 [ Optional ] Li River Cruise: Li River boasts the largest and most beautiful scenic area in China, her landscape decorated with rolling hills, steep cliffs, fantastic caves, leisurely boats. Cruising on Li River, you can respire fresh air, feel the gentle breeze and appreciate the fabulous landscape on both sides. The total cruise journey is around 30 Kilometers and takes 4 hours. Cruise ends in Yangshuo in the afternoon, then cycle 2 hours round trip along trails to see rice paddies, farm house, green limestone hills and countryside. For those people who don't like biking, recommend you to take Golf Car Countryside Tour (Optional cost is USD 15 per person). Bike ride in Yangshuo Cycling Excursion is the best way to appreciate the pristine countryside scenery in Yangshuo as trails often lead where buses and cars can’t go. In addition, cycling riding is the most economic way to tour the Yangshuo countryside which only about 1-2 dollars per day, also a popular way. Li River Cruise Li River boasts the largest and most beautiful scenic area in China, her landscape decorated with rolling hills, steep cliffs, fantastic caves, leisurely boats. Cruising on Li River, you can respire fresh air, feel the gentle breeze and appreciate the fabulous landscape on both sides. In the morning and drive 3 hours (160 km) to Longsheng to visit Longji Dragon Backbone Rice Terrace. Stay in the mountain village overnight. [ Optional ] Sanjiang: Sanjiang, which is famous for its enhanced native culture of Dong villages, located in a beautiful river valley, visit elegant architecture of roof-covered bridges, villages, drum towers, traditional way of making cloth and embroidaries, and more. Drive 3 hours to Sanjiang County in the morning. We will visit the Chengyang Wind & Rain Bridge in the afernoon. Visit Ma'An village of Dong Ethnic. Chengyang Dong Villages Chengyang is 20 km north of Sanjiang, is becoming a popular tourist destination with backpackers. It is a region traditionally inhabited by the Dong people, bordering Guizhou to the northwest and Hunan to the northeast. 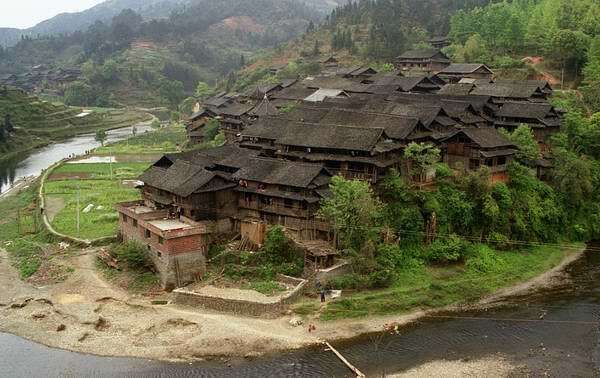 [ Optional ] Zhaoxing Dong Village: Zhaoxing, one of the largest Dong villages in the region, with more than 700 households and a population of 4000. The Dong people in Zhaoxing are all surnamed Lu. 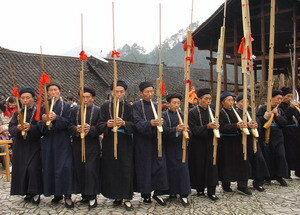 According to an old man, the head of the Dong people in Zhaoxing divided the people into five groups in order to make administration easier. Sanjaing-Heli-Tangan-Zhaoxing: Drive to the Heli Village, pass Renhe Bridage,which is a beautiful shelter bridage built in a mixture of Dong and Han architecture. Keep driving to southeastern area of Guizhou province. 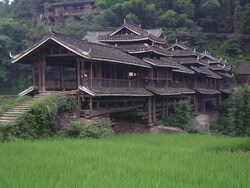 Visit the Tangan & Zhaoxing Dong ethnic villages. Stay overnight in Zhaoxing, the biggest Dong Village in the world. Drum Towers in Zhaoxing The most famous buildings in Zhaoxing are the five drum towers. According to the tradition of the Dong people, each individual drum tower represents one group of local people. The five towers represent kindness, righteousness, politeness, intellect and creditworthiness.